1. Preheat oven to 375˚F and either spray 4 muffin tins lightly with non-stick baking oil or place 4 parchment paper baking cups in muffin tins. 2. Place 1 Tbsp. EVOO in a small pan add the diced onions and peppers and cook until onions are translucent. Then add in the kale and cook until soft and the leaves turn dark green. 3. Meanwhile mix 4 eggs in a bowl with the salt, pepper and nutritional yeast. 4. Divide the sautéed vegetable mixture into the 4 muffin tin cups. Then pour the egg mixture overtop into each cup. 5. Bake at 375˚F for 15 minutes or until eggs are cooked through. For a richer cheesy flavor sprinkle a small amount of nutritional yeast on top! These seem so fancy, but are so quick and easy. 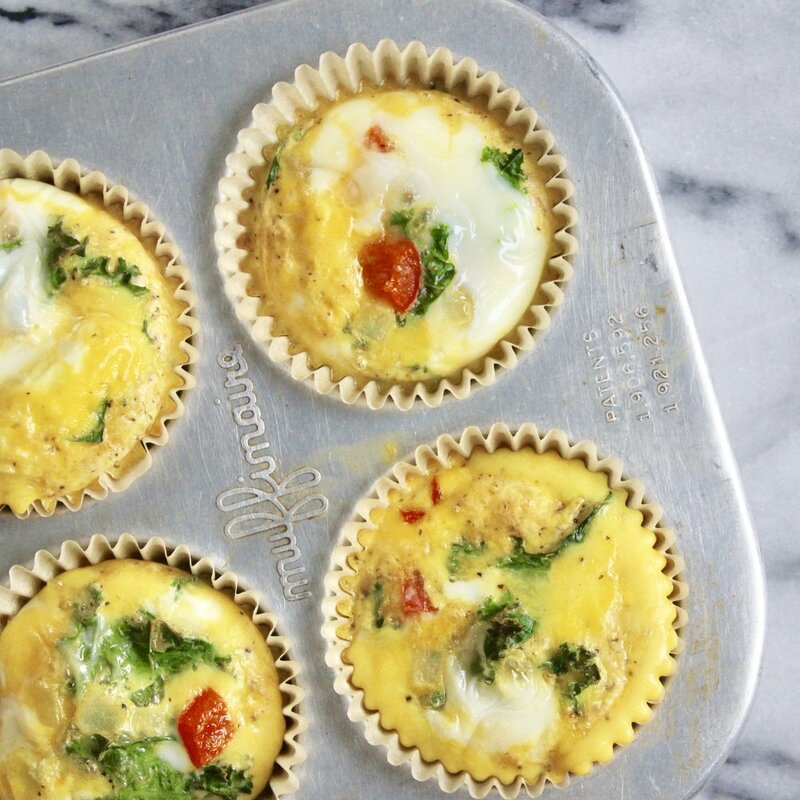 If you have leftover roasted veggies from dinner just place them in the tins, mix up some eggs to put over top and place in the oven before you have to run out the door! Any flavor combination works here, so don’t be afraid to try different kinds!